Our aim is so offer you great coffee. We believe that you enjoy your coffee even more, if it’s created in a sustainable way so that our footprint on Mother Earth can be reduced. We choose the best beans and let them roast nice and slow. These carefully selected beans are grinded and filled in capsules which are made of Plant Based materials such as Sugar Cane and/or Sugar Beet. So, the complete capsule including the foil, is made from plants materials. After usage you can throw them guilt free into the Green Bin. Under the right industrial set conditions they will fully break-down into compost. The entire capsule, can be chewed up, and spat out by our little microbial friends, leaving behind biomass, CO2 and water. 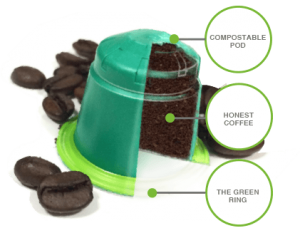 The Plant-Based capsules are marked with a green ring, to make it for the user easier to identify which capsules can be thrown in the green bin. Extra packaging (like an extra wrap around each capsule) is not needed to keep our coffee fresh. We have built in a plant-based oxygen barrier to keep our coffee fresh, so we can serve you the full aroma in one shot.